First, kindly move your cursor across the screen you are currently viewing. Notice anything different? IT CHANGES THE DIRECTION OF THE SNOWFLAKES! Tres cool. Second, I love baking. I will be the first to tell you that I don’t actually know that much about it – the science of it eludes me and I often combine the ingredients in the wrong order and end up with an edible, but not-as-good-as-it-could-be finished product. I also lack the “tools” one might find necessary to produce delicious baked goods, like a stand mixer or a spatula. Nevertheless, I persevere. My mother thinks that I am nuts. I’m currently cooling a batch of cake balls. “That’s a hell of a lot of work to put into those!” she griped as I explained how I planned to melt roughly 3983 pounds of almond bark after work so that I might dip these little nuggets of Heaven into a molten pool of Delicious. I just shook my head. It’s a labor of love. 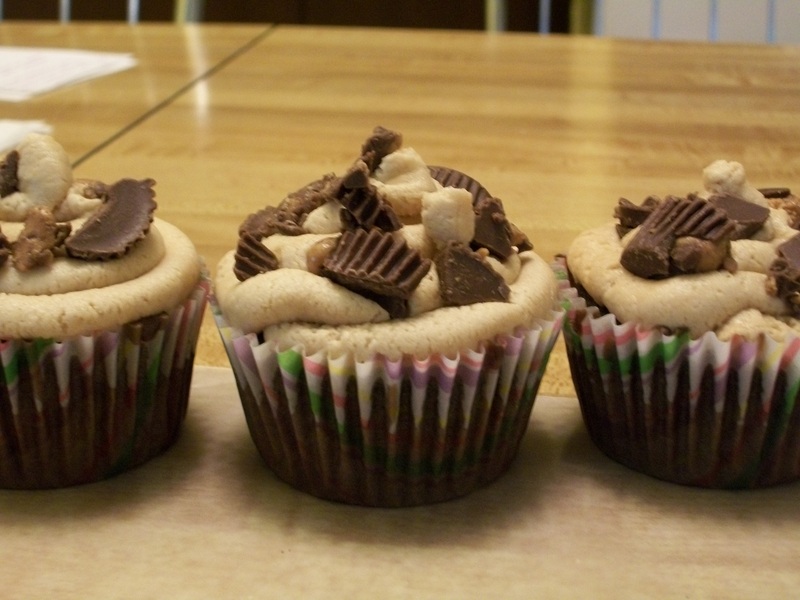 Chocolate cupcakes with peanut butter icing and crumbled Reese's Peanut Butter Cups. Basically some of the best things I've ever made. Ever. For me, the effort (and sometimes it’s a lot of effort as I experiment and try to find more efficient ways of doing things) is completely and totally worth it. It doesn’t hurt that I often have a captive (read: hungry) audience. All I have to do is bring a Tupperware box of ANYTHING to my place of work and my coworkers descend on it like a pack of malnourished wolves (that said, should I trust their opinion? I assume a malnourished wolf will eat anything, right?). But no, seriously: I wish I had more time and money to devote to this.